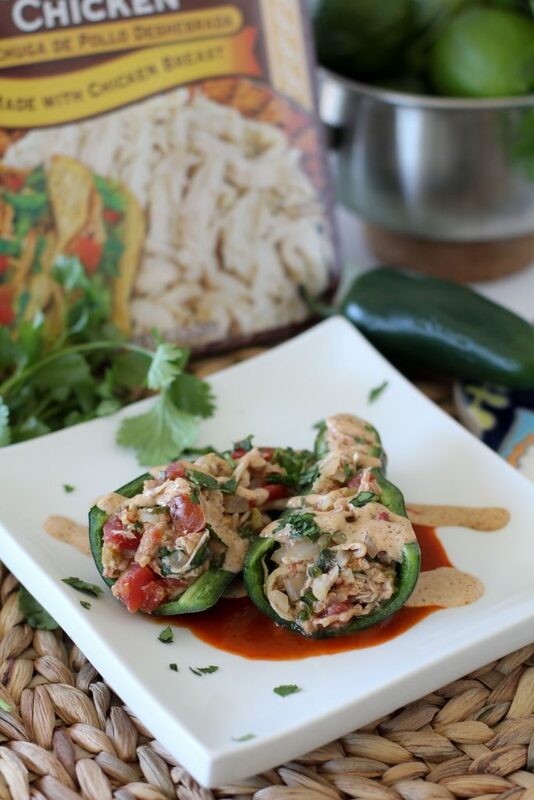 This Chicken Stuffed Poblano from The Whole Smiths in collaboration with Del Real Foods. A clean Mexican inspired dish that will leave you feeling satisfied. Paleo and Whole30 options available! Let me briefly take you down memory and reminisce over some of my favorite “mexican” dishes and spots over the years. And please note, as a grown foodie now I would’t consider much of this traditional Mexican food, hence the quotes. But as I got older you can see the evolution that takes place. When I moved down to Southern California for college it got real. I was always on the hunt for my next “best burrito ever”. But by then the homemade salsas started to become the determining factor in my burrito quest. My favorite spot became one in Costa Mesa and I kinda stopped looking at that point. From there I moved back up to the Bay Area and San Francisco and started enjoying some more traditional Mexican fare outside of burritos like ceviche, mole, chilaquiles and more. I guess you could say I became a grown up lover of Mexican fare and Rick Bayless became my hero of the cuisine beyond burritos. And there you have it, my very brief evolution of my love for Mexican food. But when I started eating cleaner I first thought I was going to have to say adios to all of my favorite foods. I mean, how the heck was I going to indulge in my favorite burritos, enchiladas, nachos and tacos without beans, rice, grains and cheese? Well friends I’m here to tell you it’s 100% possible. A. Because there is so much more to Mexican cuisine than tacos and beans and B. With a little creativity you can incorporate some of those flavors into a more paleo-friendly inspired recipe quite easily. Basically, where there’s a will there’s a way and when it comes to food I always have a will. 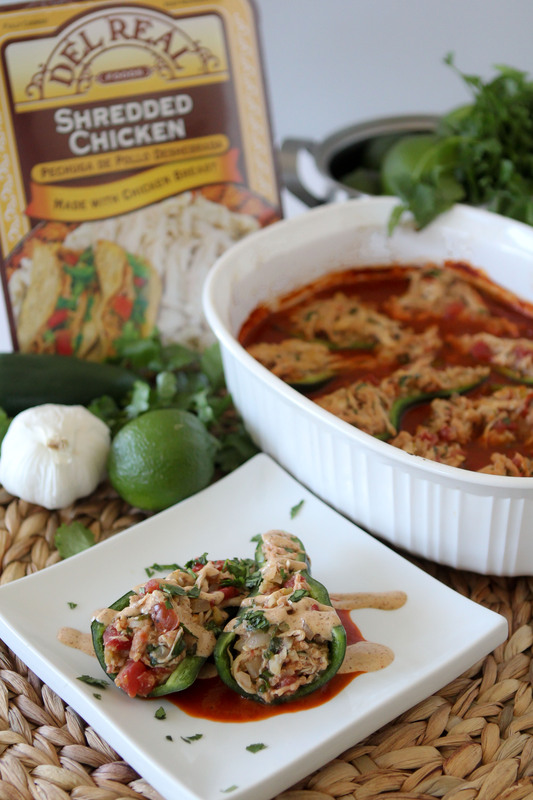 I’m also SUPER excited to be partnered up with Del Real Foods to bring you this recipe. 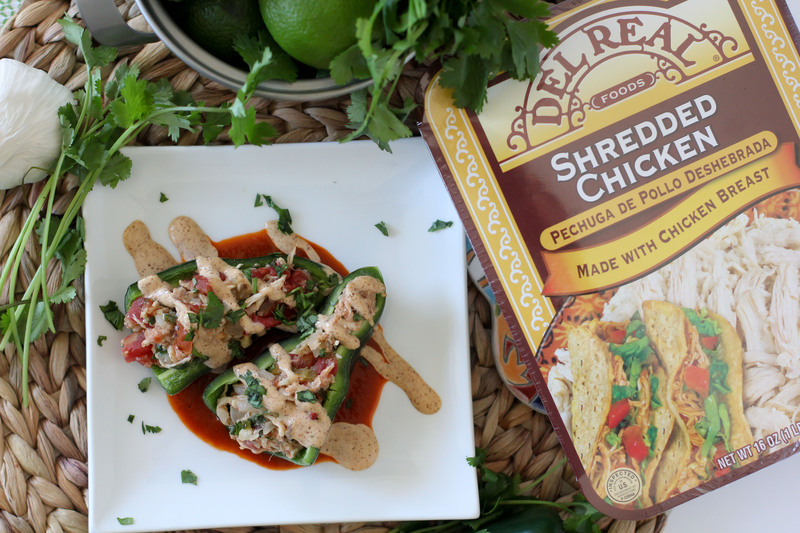 If you’ve been following my blog for awhile, you know that last year I participated in Del Real’s Blogger Recipe Contest and placed 2nd with my Paleo Carnitas Nachos with Chipotle Crema. 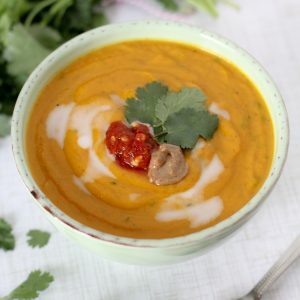 In fact, I decided to keep the chipotle crema in this recipe as an homage to that recipe! I even got to head down to LA to film a demo for it that you can view on You Tube. We’ve been using Del Real Foods products for quite some time now and I love how easy they make food prep. It’s so nice to have pre-cooked proteins on hand to add into my dishes. It literally shaves my meal prep time in half. The most important part of maintaining a healthy / clean diet is making it accessible and doable. 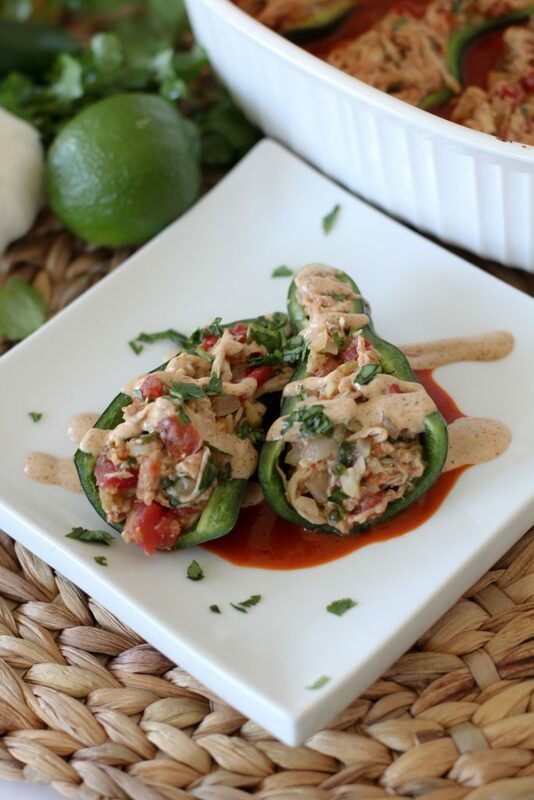 For this recipe I’m using Del Real Foods Shredded Chicken and it really couldn’t get any easier. 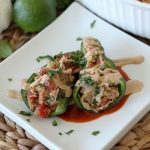 If you’d like to make this recipe Whole30 compliant you will need to make your own enchilada sauce. I recommend using Natalie from Perry’s Plate, she rocks it in the kitchen and really knows her food. 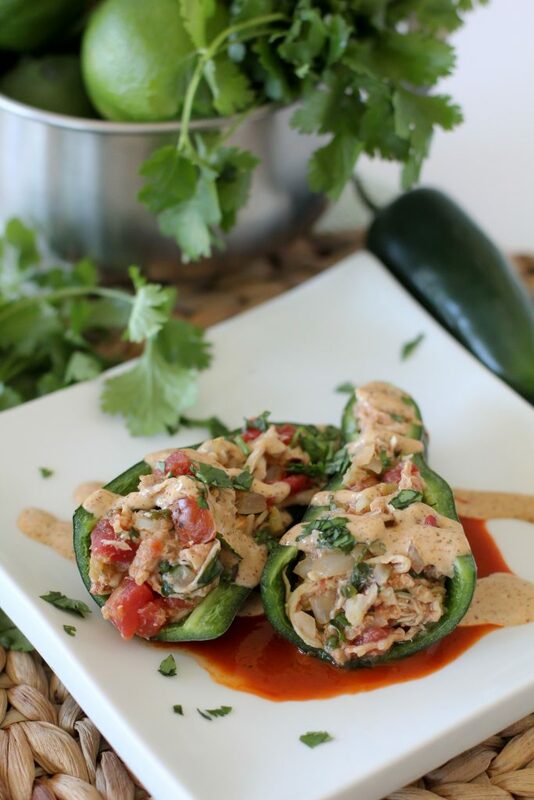 You can also make the stuffed peppers sans enchilada sauce and just plate them over some salsa. Your call! Depending on who’s eating this recipe you might want to adjust the spice level. The recipe calls for poblano peppers (because they’re amazing!) but if you’re planning to make this for kids or someone sensitive to a little heat feel free to wrap those out for some mild bell peppers instead. You can also leave the chipotle drizzle off as well. Enjoy and make sure to check out Del Real Foods for some ready to use proteins for your next dish! Chicken Stuffed Poblano Peppers from the Whole Smiths. Easy-to-make, paleo friendly, grain free and Whole30 compliant with modification. Looks so yummy! Going on my menu for the week! You mention mayo for the creme but i don’t see it listed in the ingredients. How much mayo do you need for the recipe? It’s been updated! Sorry about that! Where’s the recipe for the chipotle creme ? Hey! 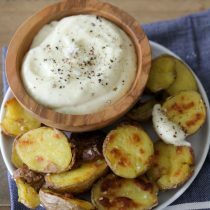 I’m in the midst of making this recipe and I can’t seem to read where you’ve noted how much mayo and chipotle powder to use for the chipotle crema…my apologies if I’m missing it, but would greatly appreciate an update to the recipe! Oh man! Apologies, it’s been updated! Do you have any recommendations of whole 30 side dishes that could go along with this? I’ve been making this almost weekly for dinner, so delicious! Leftovers are great for breakfast with a fried egg on top! Hey, Michelle! These look absolutely amazing!! However, when I look up the ingredients for the shredded chicken on Del Real Foods’ website, it lists cultured dextrose as an ingredient. This would make the recipe non-compliant for us Whole30-ers, right? I believe this is also true for the carnitas used in the Carnitas Breakfast Frittata. Once I am done with my W30, I will definitely be making this! Any thoughts on how this would save for leftovers? Or suggestions on how to do that? 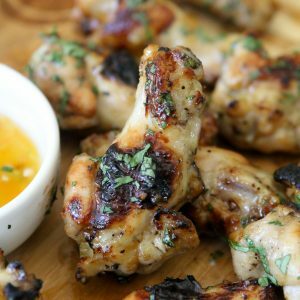 Looking to batch cook this for meal prep! Hi- thanks for the recipe. What do you do with the three garlic gloves if only some goes into the sauce.